The Allegany-Limestone girls basketball team waits to take the court prior to playing in the NYSPHSAA Class C semifinals. The Gators lost to Syracuse Academy of Science, 55-50. 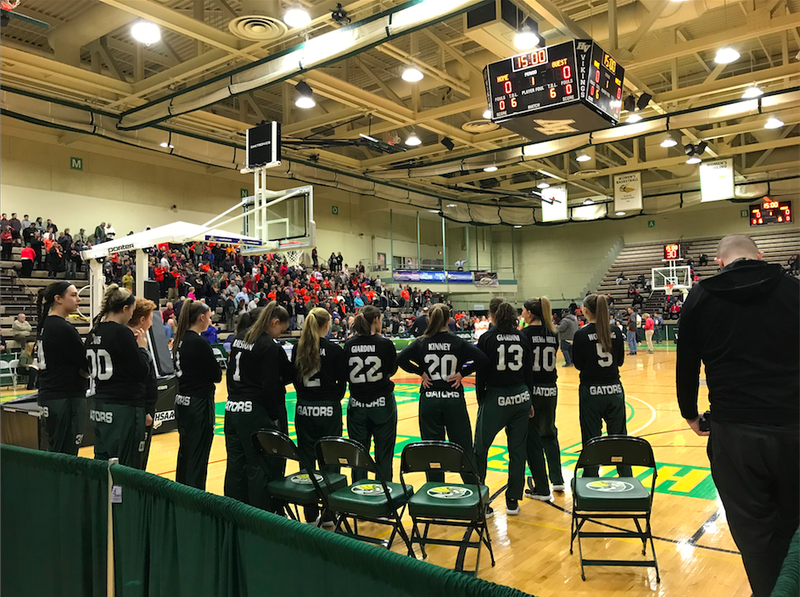 TROY – From the first day of tryouts, to the loss to Franklinville in late December, to the 18 straight wins that followed, it’s been a magical ride for the Allegany-Limestone girls basketball team to Saturday’s New York State Public High Schools Athletic Association final four. The Gators won their first Section VI title since 2009 and qualified for the state tournament for the first time since the two schools merged in 1995-96. The season also ended one day earlier than they had hoped. “That’s the sad part,” Limestone coach Frank Martin said. Up 50-49 in the Class C semifinals with 50.4 seconds left, Section III’s Syracuse Academy of Science stole a sideline inbounds pass and scored the game’s final six points to come away with a 55-50 win and a berth in Saturday’s championship. For a team that had taken care of the ball so well during their postseason run, turnovers were the downfall for the Gators (23-2) against a more-athletic Atoms (20-4) lineup that featured a strong guard duo in Diamonne Harris (20 points) and Lyrik Jackson (14 points). Limestone turned the ball over nine times in the first half but was still able to get out to a 32-26 lead. It couldn’t overcome the 13 more it had in the second half. Syracuse had two at the break and eight for the game. When the Gators weren’t turning the ball over, they were able to get whatever shot they wanted more often than not. Morgan Davis and Brooke Giardini were a big part of that. The seniors shared team-high honors with 14 points each. The 6-foot-1 Davis was the focus of Syracuse’s game plan on both ends of the floor. She finished with six rebounds, plus six of her seven blocks came before the break. “That big girl, 31 (Davis), she’s an amazing player,” Atoms coach Reginald Pickard said. “She plays aggressive, she plays strong. That team’s a good, strong-willed team that goes to her. They’re a great basketball team so we had to make some adjustments with our bigs keeping her out of the paint, trying to rush her shot. The Gators went on an 11-0 run, sparked by Giardini’s first two three-pointers, after Syracuse scored the first points of the game on a three 10 seconds in. The Atoms snapped a 4:30 scoring drought and went on a 10-0 burst to take a 13-11 lead, but two Davis free throws and Giardini’s third trey put Limestone up 16-13 after one. Syracuse’s Jackson opened the second quarter with a three, and Limestone responded with a 10-2 run to take a 26-18 lead. The Atoms made their fifth and sixth threes of the half to bring it within 30-26 before Molly Wolfgang converted a putback with three seconds left at the end of the half. Limestone struggled coming out of the locker room with Syracuse’s full-court press, as the Atoms took a 36-35 lead on a Jackson steal-and-score with 5:28 on the clock. The Gators regained the lead on a Davis layup and Giardini’s fourth three to make it 40-38 heading into the fourth. There were nine lead changes in the final frame, with neither team holding more than a two-point advantage. Harris stole the inbounds pass with 50.4 seconds to go and tossed it ahead while on her back to eighth-grader Alexius Pierce, who put the Atoms up for good. Harris made four straight free throws in the last eight seconds to seal it. Gators sophomore Tierney Hemphill finished with eight points and 10 rebounds. Other seniors graduating from this year’s team include Wolfgang, Shaelynn Maley and Anna Seamon. Corey Desiderio – Corey Desiderio has contributed to The Buffalo News' high school sports coverage since 2014. Send questions, comments or story ideas to cdesiderio@buffnews.com.